Working with executives requires unique skills and strategies. One of the challenges to wealth management is the number of advisors needed to ensure that all areas of your financial life work in harmony. Implementing sound financial strategies often requires collaborating with other professionals. Each of our clients has a unique vision for the future, and that vision should guide your journey. 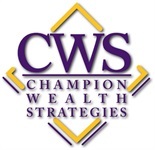 At Champion Wealth Strategies, our first task is to fully understand your values and help you clarify your objectives. We work with you to define a vision for your future that will provide a guide in developing your plan. We look at your financial life not only in dollars and cents, but also in terms of your personal values for your life, your family, and your legacy. We help you create a financial course that is clear, well defined, and-most importantly-quantifiable. Creating and implementing your comprehensive financial plan is only the beginning of the journey. We provide an ongoing process of review, evaluation, and action that helps keep you on course throughout your lifetime. A well-crafted strategy is designed to be adaptive, flexible, and open to revision as your needs change. If your compensation package includes stock options, you face a complex array of choices in order to seek to optimize their value and minimize the tax consequences. We understand the unique role options play in an investment portfolio and have the experience to give them the attention they deserve. We work with you and your tax professionals to create and execute a plan in seeking to create greater wealth. CWS can help you develop an exit strategy for a highly concentrated single stock position, producing additional income or even hedging all or a part of your position. It is vital to employ cutting edge strategies implemented by experienced professionals.